BDV: Okay, Okay, Okay. Inviting Change. Okay, Okay, Okay. I'm trying to accept and maybe even invite change. The past couple of weeks have been vastly crazy yet chill. Crazy in a sense that I'm not entirely sure I maintained full sanity throughout the craziness at work, but chill in the sense that I really tried hard to just contain the relaxing flavor of the summer. The end of July and beginning of August brought in lower temperatures, but it is still fairly warm, just the same. I'm one of those types of souls who likes moderate temperatures. 65-70 degrees (F.) is perfect for me - in the summer and spring. Autumn - about 50. Winter. Well, that's a different story as it depends on my mood, my schedule, (which affects my mood greatly) and my location. I'll save that story for later. However, the heat makes for a great and "berry" nice weather for sun-ripened blackberries- a native Washingtonian favorite. While the heat is lower, so has the energy of everyone in my household, including my Ernie-cat. I mentioned in my last #BDV blog that Ernie, my beloved tabby, had to have a life-saving surgery. He is now fully recovered, thank the Heavenly Goodness. He has had all his tubes, stitches, and even the ugly and rather uncomfortable cone removed. He's a happy furbaby again. You'll see a picture or two of the handsome, happy feline in my photos, along with a photo of his shenanigans. During the cone-days, he decided to throw some feline tantrums - the full extent of such tantrums shall be documented on another day, but you will see that he had other ideas. Amongst some other things that are notable throughout the past couple of weeks, despite me wanting to often resort to pulling out my hair when stressed out with work and coming home to kitty cat tantrum after-effects, I have maintained a full head of my locks. That being said, I feel as though a change is due. I've been wanting to do something crazy to my hair. A soft spiral perm. SOFT. (I really don't want to look like a living caricature of the 90s.) I've also been contemplating purple. I used to have purple hair - when I was a junior in high school. We'll see. Summer is a time for contemplation for me--always has been and likely will always be. I've been thinking about my life's trajectory, as usual, and have been wondering if this is where I want to be. With photos, I can see if my life is satisfactory, in need of extra fun, or a time for peace. I've had some peace, and I've had some... craze. Would I change it? Some. Not all. The #BDV lesson for today is to remember to take the time for a reflection period. You never know what you'll find in your life. For me, it's the realization that amongst the crazy uncontrollables, I have some stability in that change is constant. I have to invite change into my life on a daily basis to be able to enable the victories and triumphs to prevail. It probably sounds very cliched, and trust me, I find them to be of great annoyance, but it's the truest form of self-improvement. Luck is how you view life. 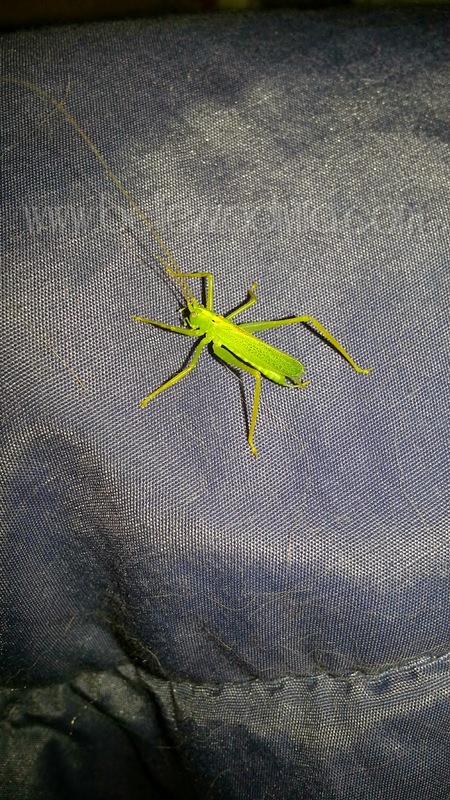 Like the unexpected cricket in my bed, you will find welcoming symbolic gestures subtly given to us from Life. Invite change. That's how you change your luck. In the next week, what shall I show in my changes? A blog post, for one. A better attitude? More photos? Appreciation? Whatever comes, be ready! Have an inspiring and reflective day, my loves.